This recipe was inspired by the gorgeous brilliant blue colour of Bluebird Tea Co’s blue raspberry tea. 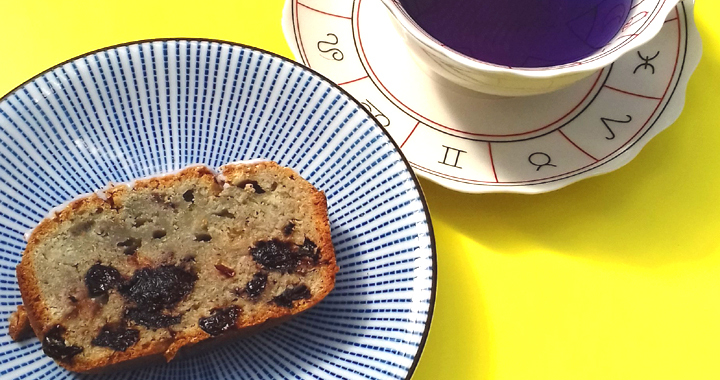 I was really intrigued to see if its colour was strong enough to colour the cake blue, so I came up with the idea of using it instead of black tea in a tea loaf. I did contemplate adding natural blue food colouring to colour it more vividly, which you can do (although from past experiences of trying to get a red velvet cake red- you need to add a lot!) but I don’t like to add ingredients for the sake of it, so I left it out here. As you can see the cake isn’t blue (it does have a slightly bluish tinge), but it tastes great anyway and has slightly fruity undertones from the tea and blueberries. You can use any green tea you fancy here (try using different flavoured green teas) and alter the dried fruit to suit. This makes the perfect cake to accompany an afternoon cup of green tea or to follow a meal when you want something a little bit different to a normal cake. 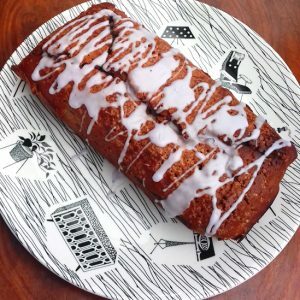 I’m always on the lookout for Asian inspired recipes for sweet things to follow a ramen meal and with the addition of green tea, I feel this cakes now falls neatly into this category. Perfect with a cup of blue raspberry tea- naturally! Check out Bluebird Tea’s website here. They are a small business based in Brighton and have the most amazing selection of teas! Preheat the oven to 180°c and line a loaf tine with greaseproof paper. Soften the blueberries for about half an hour in the tea. You don’t have to do this but it helps infuse all the flavours. Cream together the butter with the sugar and then add the egg. Mix until well combined. Sift the flour and add to the mixture, along with the tea from the blueberries. Mix until well combined again and then add the blueberries and stir them through the mixture. Pour the mixture until the tin and level. Sprinkle demerara sugar over the mixture and cook in the oven for one hour, until when inserted a cake tester/ knife comes out clean. Remove from the oven and allow to cool in its tin for fifteen minutes. Turn out the cake onto a cake rack and allow to cool completely. Sift the icing sugar and add the remaining tea to make an icing thin enough to drizzle but thick enough not to run right off the cake. Drizzle from a spoon over the top of the cake. Posted in Recipes, Sweets and Desserts and tagged Cake, Green Tea, Recipe.